As an employer, you know that sponsoring social events is a surefire way to boost office morale and keep your employees in good spirits. Be it a monthly happy hour, a holiday party, or a daytime outing to a nearby park for some team-building, you have lots of ways to reward your employees with time away from their desks. However, even the best intentions can put your company at a legal disadvantage if these events aren’t well-organized, especially if alcohol is involved. 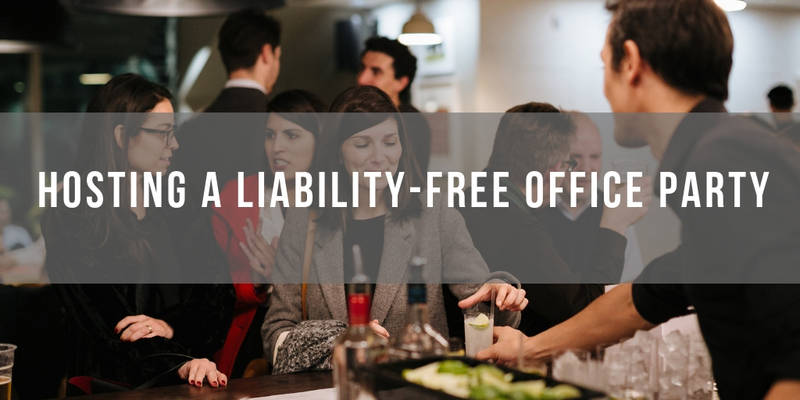 If you’re hosting an upcoming office party and want to mitigate legal liability, here’s what you need to know. Alcohol is a big draw when it comes to employee attendance at company-sponsored events. It helps workers loosen up and socialize more than they’re able to when they’re at their desks. Unfortunately, it’s also a large source of liability. Nearly 60 percent of companies serve alcohol at their office parties and far fewer take proper steps to regulate consumption. Intoxication isn’t the only concern at an office party. From an increased likelihood of sexual harassment to damage done to your company’s reputation in an always-online world, alcohol can quickly turn a fun social event into a corporate nightmare. Remind your employees that all regulations regarding office conduct still apply during any parties or events. Also, it’s a good idea to enforce a social media policy that prohibits employees from posting images or videos of the office party without a manager’s consent. Another source of liability stems from the prevalence of drinking and driving when an employee leaves an office function. While an employee’s negligent behavior outside of the office wouldn’t seem to be a direct responsibility of your company, several courts argue otherwise. There’s a legal precedent for employers being held responsible for accidents, injuries, and even fatalities caused by drunken driving after a corporate gathering. Those regulatory measures from earlier? They’re important when it comes to ensuring a safe, fun office party. You have several steps to take to mitigate the possibility of alcohol-related liability. One of the best methods for regulating office party alcohol consumption is the use of drink tickets. This way, you have more direct control over how much any given employee imbibes while at a company function. Some companies take it a step further and only offer lower ABV drinks such as wine and beer, forgoing hard liquor altogether. It’s also a good idea to review your employee handbook and make amendments that specifically relate to office parties. Incorporate comprehensive anti-harassment policies and remind your employees of these in the days leading up to the party. Always enforce your workplace dress code as well, to avoid the possibility of inappropriate attire. Lastly, make attendance voluntary and in no way suggest that an employee’s standing in the company would be harmed by not attending. Have a lawyer review your handbook to ensure your employee code is fair and legal. A lawyer is also an excellent source of information on preventing liability and defending against any claims or lawsuits that arise after an office party. Many law firms, including Preszler Law, have extensive experience with liability claims and employer protections. While an office party is expected to be fun, it also needs to be safe. Make sure you’re taking the necessary steps to ensure every one of your employees feels both welcome and comfortable at any office events. Regulate alcohol consumption if needed and contact a legal representative if you’re unsure of your legal standing when throwing a party. As long as you’re doing your best to focus on employee wellness, everyone is bound to have a good time.